The last of his kind, Aang is a young Airbender who is the next in a long line of Avatars. Not ready to realize his potential, Aang is lost for 100 years. Upon his return however, Aang discovers that the Fire Nation has wiped out his people and oppressed the Water and Earth Nations eliminating all other element benders. Aang with the help of a few new friends must band together to stop the Fire Nation and realize his true destiny. M. Night Shyamalan has spent his career creating original screenplays and films. Films that have generally divided crowds and had some type of spin to draw the viewer in. 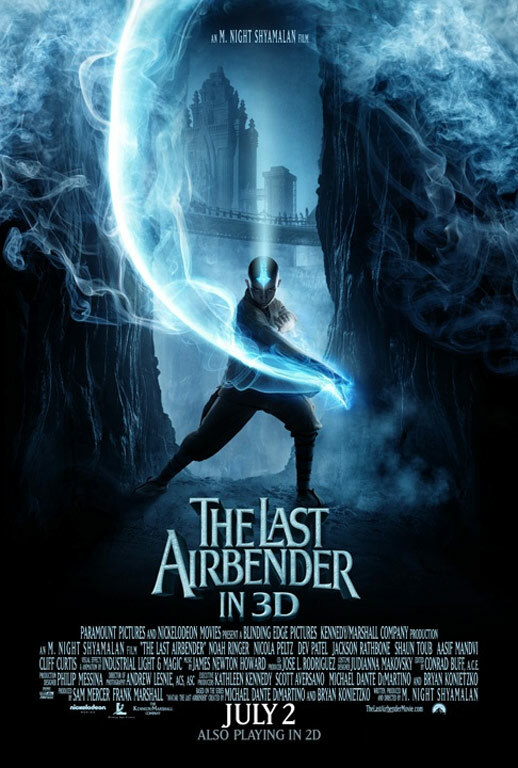 "The Last Airbender" represents the first time Shyamalan has strayed away from one of his original stories and instead has adapted the popular Nickelodeon cartoon series. Sadly, there are a number of problems that stand out in his adaptation, but luckily I still found plenty to enjoy and keep me engaged. Before jumping into a full critique of the film, I should note, I only watched the traditional 2D transfer of the film in Digital projection. I did not see the 3D transfer of the film. Going in I knew that 'Airbender' was not conceived with 3D in mind, therefore why see it in 3D. I'm not a fan of 3D technology personally, but this review is not an op-ed piece on the overuse of 3D, so I'll get on with the review. The original Nickelodeon series was 3 seasons long and housed over 60 episodes, while this film is only the first part to a proposed trilogy. Shyamalan gives "The Last Airbender" a subtitle of 'Book One: Water' which mirrors the first season of the series. The problem with adapting the television series into film, is it means condensing a ton of material into under two hours. The outcome of all that minimizing could leave fans feeling like the film only skims the surface of the series content, which it does. The story that M. Night Shyamalan explores is broken up into a few different plot developments and bounces around between them with very little structure. One, Aang's spiritual path to becoming the Avatar. Two, the Fire Nation and their drive to control the globe and all other Bending Nations. Three, Aang, Katara and Sokka's journey in uniting the Element Nations. The plot developments are flawed as are the performances within them, however they are not so disjoined that it ruined the overall experience. This is not to say that the film doesn't have an overall flow. It very much has forward momentum and feels like it is moving towards a resolution, just don't expect that resolution to be the final one. This is only the "proposed" first step of three. Despite a few select actors, "The Last Airbender" is horribly miscast. Solely based on exterior, M. Night Shyamalan completely ignored the source material and its characters. All of the original characters looked to have some type of Asian decent, where all of the main characters here seem to be white. The sad part is that most of the non-speaking supporting roles are cast with proper ethnicity, but then the major roles aren't. It is something that screams foul, not necessarily by Shyamalan, but by executives who may have baulked at the idea of an all asian leading cast in an American film. Sad that I am typing something like that in the 21st Century, but regardless, its right there in front of our faces. As for the cast themselves and their performances, most fell flat. M. Night Shyamalan has never been very good at penning emotional dialogue and here is no different. The entire cast outside of Dev Patel as Prince Zuko and Shuan Toub as Uncle Iroh are extremely stiff. Noah Ringer who plays Aang, never seems to get comfortable in the role. Something that could be argued as implied considering Aang, has some pretty big shoes to fill as the Avatar. The brother and sister characters of Katara and Sokka are painfully portrayed by Nicola Peltz and Jackson Rathbone. Peltz more so than Rathbone considering she narrates the 103 minute adventure. The odd aspect to the multiple bad performances in 'Airbender' is their combined effort remains likable. I stayed engaged in the developing dynamic between Aang, Katara and Sokka. The bond that the group develops worked very well for me and should be extensively explored in further sequels (if made). I also really enjoyed Prince Zucko's conflict. The banished Prince who desperately wants his father's respect. Patel played this role really well, so well I almost wished he was the main character. In a movie called "The Last Airbender" you should expect a little bit of magic and/or element bending. Luckily I really enjoyed all of the element manipulation and fantasy. The film spends most of its energy on water, fire and air bending. Very little earthbending is done, however the limited stuff that is shown, is pretty cool. The firebenders who need actual fire in order to manipulate it, do come across as inferior despite their large numbers. With limited amount of fire, the firebenders, are left to only have spurts of flame to use. That is not to say the firebending isn't fun to watch, because it is. The difference is air and waterbenders have unlimited amounts at their disposal, especially when waterbenders live on water. The fighting choreography mixed in with the element bending is also entirely pleasing. This is one avenue that I applaud the child actors cast in 'Airbender'. Noah Ringer does a solid job with all of his fighting sequences, as does Dev Patel. Even Nicola Peltz handled her scenes fairly well. Ringer is the most impressive considering much of the film he is evading capture from the Fire Nation and thus constantly fighting their minions. The fighting sequences actually come across as the most natural moments for Ringer. For much of the film, Noah seems fairly detached, but in all the fighting and element bending scenes he is clearly having fun. In the end "The Last Airbender" has problems but that doesn't mean its not an enjoyable experience. Its not a film that is geared towards everyone. The movie feels targeted for younger audiences and seems to stay in their emotional and logical spectrum. That is not to say that a kids movie shouldn't be held at the same standards as others, "Where the Wild Things Are" is a perfect example that they can, but 'Airbender' just plays as lighter fare that should be taken with a grain of salt. Great Review! I am glad to see someone that doesn't completely hate the movie. One thing I wish was different was the casting of Uncle Iroh. Although the role is played well, his appearance does not match the one in the series. Also, there was no opportunities for him to demonstrate his wisdom as well as his sense of humor. The latter was missing throughout the entire movie and i feel it was an important part of the series because Aang is so young. Thanks again!